This Page Contains Information about our Shop Curtains, Strip Doors, Welding Screens, and Welding Blankets. Now workers painting, sanding, or washing can work virtually side-by-side with people needing a clean environment. Adjust-A-Wall consists of a sturdy 16-gauge track system, durable yet smooth rolling nylon rollers and a heavy duty vinyl curtain. 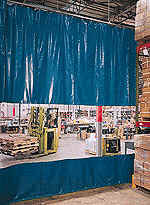 The curtain features a 52" high clear vinyl center section that starts 30" up from the bottom. the top and bottom sections are 14 oz. vinyl coated polyester which is available in many colors to choose from. Curtains are supplied with hook & loop closures to provide seamless connections and easy access to enclosed areas. sewn with weighted hem chain at the bottom. standard hardware is supplied for suspending the system from overhead. systems are normally suspended by chain. Hardware is available for your choice of suspended mount, flush to ceiling mount, wall mount, floor mount or any combination of all 4. A must for your body shop! Portable screens provide protection from sparks or UV rays, wherever you need it. The frame consists of strong yet lightweight square steel tube design that will not slip or twist like round tube frames. Slip fit construction permits fast and easy assembly without tools. Screens are available in your choice of several materials. Quick, easy set-up and take down. No hardware to install. No tools necessary. 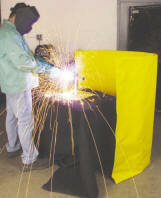 Roll open and stand on horizontal end for use as welding, grinding or safety shield. Roll up and carry away. Lightweight, flexible inner core wire mesh permits the Port-O-Screen to stand alone. Built-in tie strap and carrying handle. 14 oz Safety Yellow Vinyl Laminate provides resistance to flame—NFPA-701 certified. 12 oz. Olive Drab Cotton Duck is a permanently treated cotton to repel water and resist mildew. CPAI-84 approved for flame resistance. Heavy duty PVC strip has excellent optical clarity. Permits good visibility through the doorway or curtain. Strip Doors are supplied with universal mount hardware for easy installation to horizontal or vertical surfaces. Browsing our Store for Information not enough for you? Want something more permanent? You can also download a (24.3MB) file of the entire catalog. If you download any of our catalog pages, you'll need Adobe Acrobat Reader to view them. If you don't have it already, get it here for free.